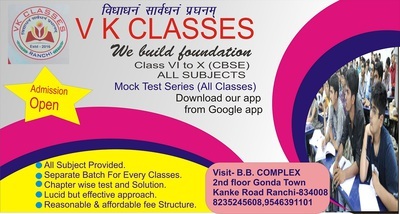 Welcome to Vk Classes (We Build Foundation Class Vi to X) Admission Open for New Session 2019-20. (Hurryup Admisson Is Goingon) Vk Classes Will Help the Student to Develop Their Motorskills, Language Skills and Social Skills With Activities Specially Designed for Them. •	Mock Test Series (All Classes) •	Facilities Provide by Us: •	All Subjects Provided •	Separate Batches •	Chapter Wise Tests •	Lucid but Effective Approach •	Reasonable and Affordable Fee Structure Hamari to Admisson Ho Gai Ab Apaki Bari? For Admission Contact: 2nd Floor, B.b. Complex, Gonda Town Kanke Road, Ranchi, Jharkhand – 834008. For Children Admission, Call Up : 8235245608, 9546391101.